A common problem for any new business is attracting enough customers and revenue to stay afloat. This is difficult enough in a “single-sided market” like selling products to consumers. Those issues are only magnified when you need to attract customers to both sides of your business — when one customer supplies services, while the other customer consumes them. Known as “double-sided markets”, that’s exactly what a job board website is, and solving this conundrum is vital to your success. Although it’s a difficult issue, it’s not impossible to solve. We’ll explore the challenges you might face and provide practical solutions to attract both recruiters and candidates, so you can build your market quickly, deliver real value to both sides, and thrive in the job board marketplace. To have a successful job board you need recruiters and employers to post a range of relevant jobs and qualified candidates to apply for those jobs. To get recruiters to post they must know you have access to a pool of qualified candidates. To get candidates to visit your job board, you must have job listings and resources. If there are no job listings, candidates won’t come to your website and apply. If there are no candidates applying, employers won’t post jobs. You need to solve both sides of this problem at the same time to be successful. This means you have to be attractive to both employers and candidates, so neither side feels they are wasting their time. To attract employers you must demonstrate you have regular, qualified candidates who visit your job board and apply for roles. To attract candidates you must provide a variety of relevant job board listings suitable for their expertise, experience, and career aspirations. You need to start solving the chicken and egg problem somewhere, and we recommend beginning through posting job listings. Finding listings and posting them is essential to attracting qualified candidates. It’s easy to get job listings even if no recruiters or employers are currently posting them directly on your website. One option is to backfill your job board with jobs from other job aggregators and services. A recruiter or employer goes to another job board and posts their role. 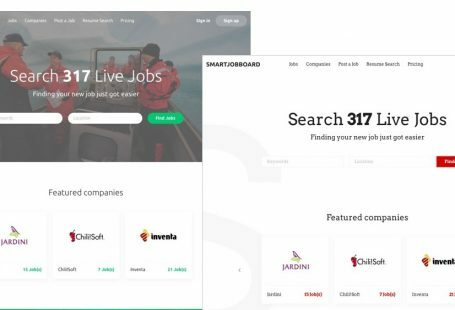 Job board aggregators scrape all these job board websites and create a comprehensive list of jobs. You can automatically get that list posted to your job boards based on criteria and filtering that you select. This option has the advantage of automatically providing you with plenty of job board listings with little effort on your part. The downside here is that when a job seeker clicks on your listing, they may be directed back to the aggregator to see the description and apply. This means they will work out that you didn’t originally publish the job and that they can carry out a job search and apply for jobs directly from the aggregator. Another useful way to increase your job listings is to go to companies in your niche and look for the positions they are advertising for. Copy the content and paste it into your job board software. Companies won’t generally mind the free traffic, and it can also help you get noticed by recruiters in your industry — it will certainly make future conversions easier if you can demonstrate they are getting qualified applicants via your listings. The only downside of this approach is that it can be a fair amount of effort to manually track, copy, and paste relevant jobs to keep your listings fresh. This approach is a combination of the previous two ideas — copying and pasting jobs from aggregators and other boards. To avoid issues with a conflict of interest, you should copy and paste from boards who are not your direct competitors. I’ve taken a small interview from Andrew Statsenko – CEO of relocate.me (a job board for developers who’re willing to relocate) specifically for this article. He’s shared with me some tips they used to get job posting for their site when they only started. “We copied jobs from job aggregators, mentioning the source in the job description (e.g. Glassdoor or Indeed) and redirecting the candidate to the company site to apply. We didn’t receive a notice from any company, requesting to remove their jobs. We would happily do this if they asked. But who would want to lose free traffic? Once you have job listings you need to work on attracting candidates. 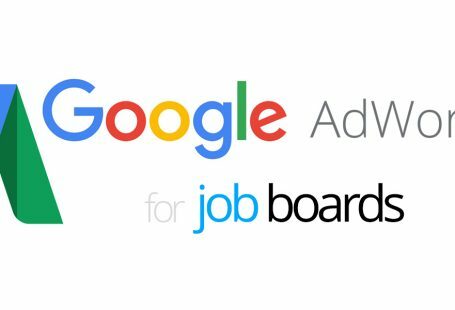 It’s a large potential audience and being able to show good job board uptake and visitor numbers through Google Analytics is a big part of attracting paying recruiters. Employers need to be convinced that you have a stable stream of qualified candidates if you want to persuade them to advertise with you. One of the most vital parts of attracting the right candidates is through providing a unique job board service they can’t get elsewhere. The easiest way to do that is by differentiating yourself by offering niche jobs and other useful blog content. 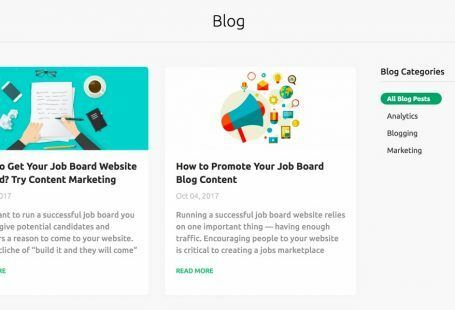 Once you’ve created a niche job board including useful resources, blog posts, and guides, you should promote that content so it reaches candidates and recruiters and attracts them to your website. 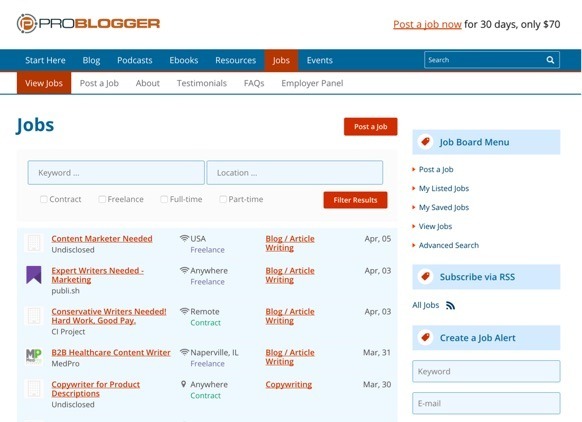 A great example of this is ProBlogger — originally built as a helpful resource for freelance bloggers and people developing company blogs, they now run a very successful jobs board for freelance writers. They successfully leveraged their good search ranking and extensive writing resources into an essential jobs service. Many candidates use social media to find work. Whether that’s specific Twitter hashtags, Facebook Groups, or LinkedIn resources, these are all extremely useful channels to attract qualified candidates. You will need to create and build up a strong social media presence so you can share employment opportunities with your followers. One job board that’s used this strategy very effectively is HR Tech Talent. 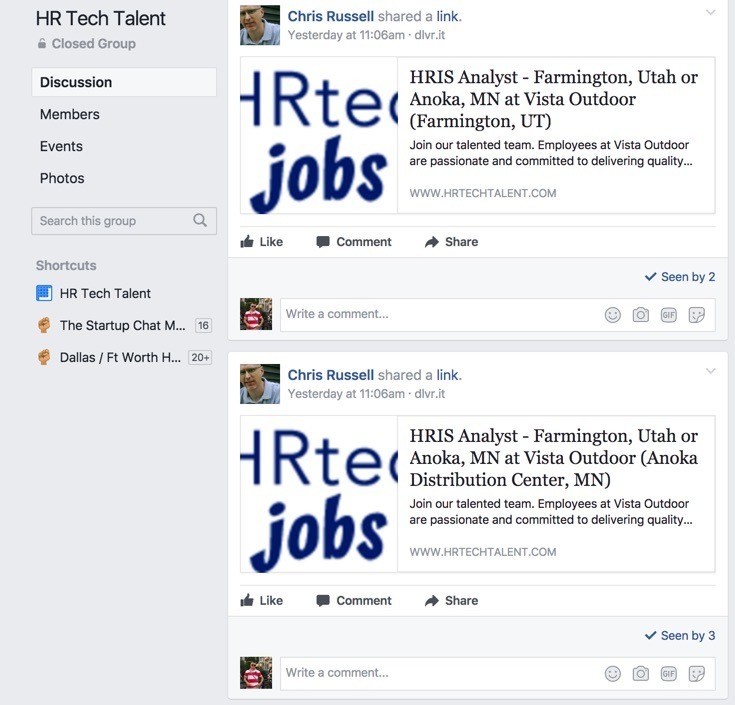 They combine an effective job board with an active Facebook group where they post new HR employment opportunities. The two biggest paid advertising opportunities are Facebook ads and Google AdWords. Beware though, these options can be expensive, and are best used when you are already generating revenue from your job board. Once you’ve created job listings and started attracting candidates, it’s time to start approaching paying customers — employers and recruiters. If you already have experience in your job board industry, start by reaching out to your contacts and network. Put together a compelling pitch covering the value of advertising on your job board. Include details about visitor numbers, qualified candidates, and other reasons to advertise with you. Asking the candidates who visit your website. Searching Google for “Jobs in [your niche]”. Looking at competitor job boards. The idea is to create a shortlist of businesses in your industry who regularly advertise for jobs. Try to get an idea of their demands over time as this will help you create a compelling offer for them. Offer a free trial for your customers, for the first month or two. Provide a substantial discount if they sign up for membership or a certain number of job postings in advance. Help them to create an account and post their first jobs. Provide reassurance on how easy it is to use your job board system — they might be a non-digital business, or already operating a different system. Give them analytics and performance information to validate your services. “We started to build our job board and attracted employers. Fortunately, we had a small network in our niche. We were looking for early-adopters who were inspired by what we’re doing and had a real problem in attracting qualified professionals. As you can see, the chicken and egg problem isn’t impossible to solve — you just need a plan and a strategy. Start by posting job listings, then attract qualified candidates, research employers, and finally give them an incentive to use your job board. Once you’ve achieved that, your job board marketplace will become more self-sustaining, and will build a momentum of its own. If you’re a job board owner who has successfully navigated this problem, we’d love to hear from you. Please share your experiences in the comments. The post is written in a very good manner and it entails much useful information for me. I am happy to find your distinguished way of writing the post. Thanks for this awesome post. It is extremely helpful for me. Good work…unique site and interesting too… keep it up…looking forward for more updates.i was really impressed by your blog please keep on sharing such blog.